Portable dog grooming tables come in a variety of styles and sizes. These tables need to be reasonably lightweight and able to fold down easily so they can fit inside a vehicle for transport to the next location. Take a look at a few models to consider. 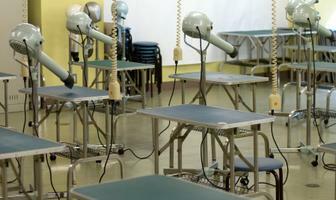 Cherrybrook is a good resource for portable dog grooming tables. The Precision grooming table is built for heavy-duty use. It comes equipped with a side clamp to hold a 36-inch grooming arm, and the table is water-resistant and non-slip. You choose from three sizes, either with or without the arm, and prices vary accordingly. The small size table without an arm runs about $106.00. The Champagne adjustable grooming table is equipped with spring-loaded locking pins on the legs for quick and easy height adjustment. This is a great feature if you need to groom dogs of varying heights. This model also has a water-proof, non-slip rubber tabletop. Three different sizes are available, and prices range from approximately $230.00 for a small table to about $255.00 for a large table. 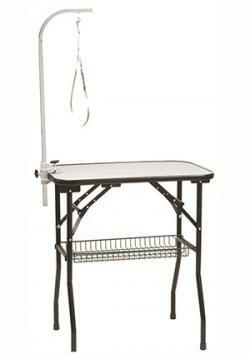 Pet Discount Supply offers folding grooming tables in several styles as well. Their inventory changes frequently, so check out their website for the latest models available. Decide what you're really looking for before you begin shopping. If you primarily work with Toy breeds, there's no need for a 48-inch grooming table that weighs more than a small table. If you work with large breeds, buy the highest quality table you can afford because it needs to hold up to a lot of wear and tear. Once you know what you need, it's easier to narrow down your choices and zero in on the portable grooming table that is right for you.